So you think you know about Football? These days everyone seems to be an expert! Well, here is your chance to prove that you really do know your stuff. 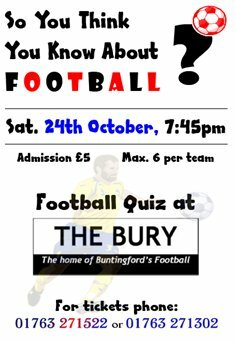 On Saturday October 24th we will be holding a football quiz at The Bury; up to 6 players per team, a mere £5 per person to enter. Will your team be the one that prooves itself to be the definitive source of football knowledge? Book your tickets now by calling The Bury on 01763 271522. The fun starts at 7:45pm - be there!